Although the Individuals with Disabilities Education Act (IDEA) does not guarantee a right to special education services for private school students with disabilities, the Eighth Circuit recently held that Minnesota law does require public school districts to provide a free appropriate public education (FAPE) for private school students, as well as the right to dispute the provisions of special education services in an impartial due process hearing. In Special School District No. 1 v. R.M.M., 16-1601 (8th Cir. June 29, 2017), R.M.M., a student who attended a Catholic private school in Minneapolis, received an evaluation from the Minneapolis Public Schools (Special School District No. 1), in the fifth grade for special education services in reading, written expression, and math. After the Catholic school informed her parents that it could not provide the special education services that the student needed, the student transferred to Minneapolis Public Schools (MPS). The student sued MPS for failing to provide appropriate special education services while she was enrolled in private school. The Administrative Law Judge concluded that R.M.M. had been denied a FAPE; the federal district court dismissed the FAPE claims again the school system, but held that Minnesota law granted private school students the right to under the state law counterpart to FAPE. The district court also ruled for R.M.M. on the issue of whether private school students in Minnesota are entitled to a due process hearing to dispute whether they have received a FAPE. On MPS' appeal to the Eighth Circuit, the appeals court held that Minnesota's provision went beyond the minimum requirements of the IDEA, and when comparing Minnesota's statute with language in IDEA, the Eighth Circuit found that the Minnesota legislature intended to provide private students the right to a FAPE, even though the statute does not use the term. The applicable statute, known as the shared-time statute, provides that “No resident of a district who is eligible for special instruction and services under this section may be denied instruction and service on a shared time basis . . . because of attending a nonpublic school.” Id. § 125A.18. The appellate court also affirmed the district court on the issue of R.M.M. 's parents' ability to to an impartial due process hearing under state law. The parents did have such a right under Minnesota law, the court held, rejecting MPS' argument that only the school district could pursue such remedies when a child was enrolled in a non-public school. The case, Special School District No. 1 v. R.M.M., 16-1601 (8th Cir. June 29, 2017), is available here. The case for early childhood programs as remedies for inadequate educational opportunity is now more compelling than ever. Scores of scientific and social science studies over the past ten years have made increasingly clear the extent to which differences in the quality of care and enrichment that children experience in their earliest years powerfully shape their future educational careers and thereby reinforce intergenerational cycles of inequality. [T]his Article aims to resurrect, and reinvigorate, [Harvard School of Education Dean Jim] Ryan's argument in favor of preschool as an essential remedy in education adequacy litigation. But whereas Ryan--based in part on his reading of the existing social science literature--focused specifically on adding one additional year of pre-kindergarten schooling, this Article argues for an even more robust expansion of early childhood-focused efforts. Relying upon a mounting body of research on the importance of children's home literacy environments and development experiences during infancy and toddlerhood--as well as empirical findings from a number of controlled field experiments--this Article also argues that states should implement and fund programs to provide developmental support for economically disadvantaged children in the first years of life. On Tuesday, the New York Court of Appeals dismissed most of the claims in two lawsuits that alleged that the state has failed to adequately fund New York City public schools and thus violated the state constitution's education article's requirement to provide schoolchildren with a "sound basic education." The suits' plaintiffs contended that NYC schools received millions less than they were entitled after the legislature failed to fully fund the education formula it devised to comply with court orders in the long-standing equity suit, Campaign for Fiscal Equity, Inc. v State of New York. New York state froze education funding in the 2008 recession and reduced it thereafter, creating a nearly two billion dollar education funding deficit since the freeze. The plaintiffs in one of the suits, New Yorkers for Students' Educational Rights (NYSER), an educational advocacy group, sought relief for schoolchildren across the state. NYSER's funding adequacy claim survived, but the Court of Appeals limited the claim to NYC and Syracuse, where the plaintiffs had provided specific allegations of a causal link between budget cuts and education impact. The other plaintiffs, a coalition of parents (Aristy-Farer), argued that New York's withholding of $290 million in 2012 to the NYC school district as a penalty when the city failed to comply with state law requiring districts to conduct performance reviews of teachers and administrators violated the education article. The Court of Appeals held that this allegation did not state a cognizable claim as the education article does not require a particular amount of state funding. The remainder of the Aristy-Farer plaintiffs' claims were found to be inadequately pled as there was no specific allegation linking the failure to fund public schools with deficiencies in the city's education program. The Court of Appeals affirmed the Appellate Division's decision to allow two of NYSER's claims--one challenging the adequacy of the State's education funding accountability mechanisms and another the inadequate funding of NYC and Syracuse's school districts--to proceed. The decision in Aristy-Farer v. State (NY Ct. of App., June 27, 2017) available at FindLaw here. The price of shares of for-profit higher education provider Apollo Education Group, owner of the University of Phoenix, rose nearly 7 percent the day after the election of Donald Trump, and kept rising in the following weeks. The price had been trending downward in 2015. Various news organizations have written about similar post-election, upward bumps in the sector. Now comes the announcement on Wednesday from the Education Department that the Trump Administration intends to delay implementation of Obama-era rules aimed at curbing misconduct in the for-profit sector. So we have some evidence that investors’ expectations were accurate. Betsy DeVos, the education secretary, in a statement described the move as part of a “regulatory reset.” She did not explain precisely the reason for the reset, but more on that in a moment. The rules, slated to take effect on July 1st, were already the product of a negotiated rulemaking process. The Education Department announced a new negotiated rulemaking on the regulations, which addressed borrower defenses to repayment and the “gainful employment” requirement. The defense to repayment regulations sought to incorporate student borrowers’ ability to repay in the assessment of institutional eligibility for participation in federal student aid programs. The idea was, if a significant share of student borrowers struggled with their debts, perhaps the educational program should not be eligible to participate. A description of the rules is here. What was wrong with these rules? They were “overly burdensome and confusing for institutions of higher education,” according to the Education Department statement. The borrower defense to repayment rules create a procedure for student borrowers to contest the obligation to repay, if they can show the education provider made a misrepresentation or that the provider failed to perform on its contract with a student. The description is here. Prior to the election, there was good reason to believe that a Trump Administration might be sympathetic to the for-profit education sector. After all, then-candidate Trump was associated with Trump University, which shortly after the election last fall settled civil lawsuits filed on behalf of former students. That settlement was approved by a court a few months ago. But this week’s announcement is public executive action explicitly beneficial to the for-profit sector. Unfortunately for Apollo Group shareholders, they voted way back in May 2016 to take the company private, in a transaction completed in February. Perhaps they should have held on. In 2014, plaintiffs filed two different lawsuits challenging New Mexico's education system. The first alleged that ELL and economically disadvantaged students are receiving a substandard education under the state's funding scheme and A-F grading system. The state's education funding formula, the plaintiffs alleged, fails to allocate sufficient supplemental funds for areas were the needs are greatest for at-risk and special needs students. The funding inequity, combined with the teacher evaluation system, results in experienced teachers avoiding lower-ranked schools. The second lawsuit raises similar issues and emphasizes that the outcomes for students in the state have fallen to the bottom of nation. "These failings are costing students the opportunity to succeed," said Marisa Bono, a lead attorney for the plaintiffs, in opening statements to the court. "The state is pumping hundreds of thousands of students into the state economy who are wholly unprepared for college or career." Education officials under Republican Gov. Susana Martinez say spending is more than adequate, and that the state has added specialized programs to help struggling students while holding teachers and school leaders more accountable for students' academic progress. In opening statements Monday, an attorney for the state said high levels of poverty across New Mexico have a major impact on the results of student testing — something that won't be addressed by funneling more money toward public schools. "The evidence will show that additional spending will have virtually no effect on student test scores," attorney Jeff Wechsler said. "The defendants cannot show that spending more will impact them in any meaningful way." The plaintiffs called on Santa Fe Public Schools Superintendent Veronica Garcia — a former state public education secretary — to testify about what she described as shockingly low levels of proficiency in math and reading among graduating students. Garcia noted that many schools are not included in new programs that intercede at an early age by expanding pre-school to 4-year-olds and lengthening the school day and school year through third grade. She faulted the overall level of state funding for public schools, as well as limited funds for programs tailored toward the students from low-income households where English is not the primary language. It will be interesting to see what evidence Wechlsler uses to defend his claim that additional money is inconsequential. Maybe, he hopes to focus on "virtually" no "meaningful" effect, rather than suggest there is no effect. But even then, past research is not on his side. As detailed in Averting Educational Crisis, new research findings shoe a particularly compelling connection. For instance, Kirabo Jackson's study of three decades of data "found that a 20% increase in per-pupil funding, if maintained over the course of a students’ education career, results in low-income students completing almost a full additional year’s worth of education. That additional learning eliminates two-thirds of the gap in outcomes between low- and middle-income students." Likewise, the Kansas Supreme Court emphasized a recent study by the state itself that "concluded, with ‘99% confiden[ce],’ that the relationship between student performance and district spending was positive, i.e., that a 1% increase in student performance was associated with a .83% increase in spending." This Article shows the slow development of teacher performance reviews over time; it begins with a history of teacher evaluation from the colonial era to the present, discusses the introduction of Valued Added Modeling (VAM) to ensure student achievement, provides an overview of current teacher evaluation models and concludes by identifying policy considerations in creating accurate, comprehensive and fair evaluation systems. Survivors of sexual assault generally report negative experiences with the criminal justice system, civil law system, and college adjudicatory system--all sources of secondary trauma. This Article suggests that access to victim-centered, comprehensive legal advice at all stages of sexual assault investigations and the adjudication process has the potential to diminish secondary trauma by providing student victims with two vital tools: a choice to initiate and participate in a criminal or campus investigation by providing sufficient information for informed consent and a voice throughout the investigation and legal proceedings. Specifically, the Article argues that student victims would benefit from access to victims' attorneys at four distinct stages following a sexual assault: (1) the pre-reporting stage-to provide sufficient information and legal advice to ensure reports to law enforcement and colleges are intentional and provided with victims' informed consent; (2) the investigation stage--to ensure that student victims maintain agency throughout the investigation, help prevent unprofessional investigation techniques, and promote access to interim measures necessary to meet safety, privacy, and educational needs; (3) the hearing stage--to enforce victims' safety rights, amplify victims' voices in the proceedings, and reduce secondary trauma from victim-blaming questions and arguments; and (4) the post-hearing stage, including appeals and civil lawsuits--to provide representation in internal college appeals, lawsuits filed by the respondent or victim against the college, and retaliatory complaints or lawsuits filed against the victim, including defamation and harassment. The Minnesota Supreme Court has previously recognized a fundamental right to an adequate education in the context of school funding challenge brought under the Education Clause of the state’s constitution. Now it is faced with the issue of whether a claim that Minneapolis-area schools are unlawfully segregated is appropriate for determination – or “justiciable.” – under that same Education Clause. In Guzman v. Minnesota, a trial court judge ruled the plaintiffs’ segregation claim justiciable. The State appealed and the court of appeals reversed. The case is now before the Minnesota Supreme Court. To support the Guzman plaintiffs, Education Law Center and over twenty of the nation’s leading education and constitutional law scholars have filed a “friend of the court” or amicus curiae brief before the Minnesota high court. The brief argues that, under the state constitution’s mandate for the legislature to maintain a “general and uniform system of education,” plaintiffs’ claims of racial and socio-economic segregation are proper for adjudication by the trial court. The amicus brief cites to the landmark Booker v. Plainfield and Sheff v. O’Neill rulings by the New Jersey and Connecticut Supreme Courts, along with the numerous decisions from high courts in peer states on school finance and other equity issues, to demonstrate the responsibility of courts to decide education rights claims. The brief also emphasizes Minnesota court precedent supports allowing the segregation claim in Guzman to proceed to trial. a claim that an education system is segregated by race is justiciable because, as state supreme courts have long and properly recognized, education clauses in a state constitution not only prohibit intentional segregation that is unlawful under Brown v. Board of Education, 347 U.S. 483 (1954), but also protect students against the negative effects of segregation when they are unintentional. Segregated schools are unequal schools and therefore do not provide a “general and uniform,” “thorough and efficient” system of education, as required by the Minnesota State Constitution. There is no principled basis for treating a challenge to school segregation differently than a challenge to school financing. The Education Clause does not single out one or the other for special treatment, but is phrased in broad terms. Moreover, as in most lawsuits challenging compliance with a constitutional standard, it is a court’s proper role to apply and, in the context of individual cases such as this one, give meaning to the standard—and that is exactly what this Court did in Skeen. That is not making “policy,” as the Court of Appeals stated, but judging. The amicus also bring to the Minnesota justices attention the “robust body of research” demonstrating “that segregated schools—especially hyper-segregated schools as alleged by Plaintiffs in their Complaint—severely disadvantage minority and economically disadvantaged students, in terms of academic performance and other crucial measures of achievement.” Further, the amicus emphasize the research showing integrated schools “provide educational and other benefits to all students—white students and minorities alike.” Because these benefits are central to students’ ability to effectively participate in civil life, workplaces, and global economy in the future, diverse education settings are a necessary component of an adequate education. ELC and the Constitutional and Education Law Scholars were represented pro bono by Todd R. Geremia, James M. Gross and Christina Lindberg at the Jones Day law firm in New York and Minneapolis, and by Derek Black, a professor at the University of South Carolina School of Law and David Sciarra, ELC Executive Director. A federal class action suit has been filed alleging that Worth County (Ga.) Sheriff’s Office employees conducted a suspicionless search of 900 students at Worth County High School on April 14, 2017. Acting on information that a "target list" of thirteen students at the high school possessed drugs, Worth Co. Sheriff John Hobby placed the high school on "lockdown" for four hours while deputies conducted body searches, including feeling inside students' clothing and underwear. Although only three of the students on the target list were at school the day of the search and those students were brought to the administrative offices upon the Sheriff's arrival, the sheriffs searched all students, had dogs sniff their cars and belongings, and temporarily seized their cellphones during the four-hour search. Several students alleged that the deputies touched the students' genitalia while they were being searched. No illegal controlled substances or drug paraphernalia were discovered during the mass search. Apparently, neither the school administrators nor the assigned school resource officer (who was away from the school at the time of the search) knew of or agreed to the search. The plaintiffs allege that the Sheriff violated clearly established law by conducted a mass, physically intrusive searches without individualized suspicion. Crystal Redd, an attorney at the Southern Center for Human Rights said in a statement, “[The student-plaintiff] is going to court to hold the Sheriff accountable for treating public school children like suspected criminals.”A copy of the complaint, K.A. v. Hobby (M.D. Ga., filed Jun. 1, 2017) filed by the Southern Center for Human Rights is here. 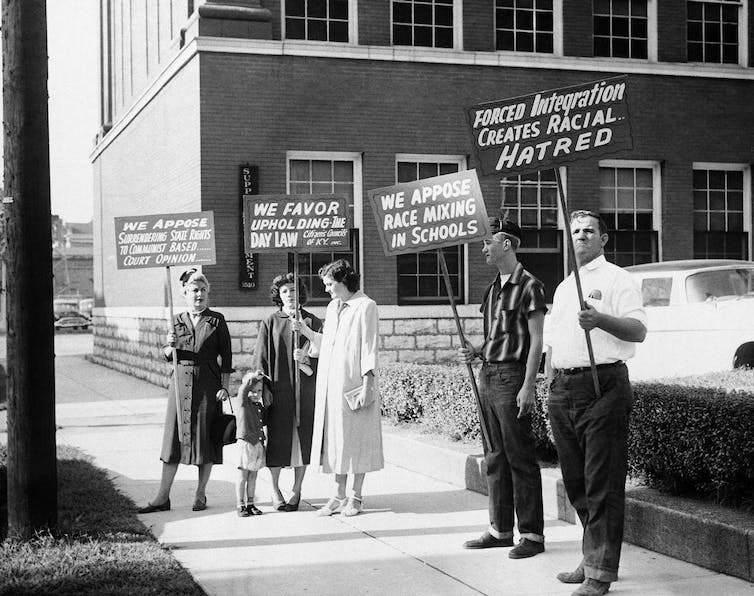 A federal district court judge has decided that Gardendale – a predominantly white city in the suburbs of Birmingham, Alabama – can move forward in its effort to secede from the school district that serves the larger county. The district Gardendale is leaving is 48 percent black and 44 percent white. The new district would be almost all white. The idea that a judge could allow this is unfathomable to most, but the case demonstrates in the most stark terms that school segregation is still with us. While racial segregation in U.S. schools plummeted between the late 1960s and 1980, it has steadily increased ever since – to the the point that schools are about as segregated today as they were 50 years ago. While proponents of the secession claim they just want the best education for their children and opponents decry the secession as old-school racism, the truth is more complex: Race, education and school quality are inextricably intertwined. With the Legislature's biennium session set to end June 5, the defeat of the Governor's bill puts an end to proponents' three-year effort to bring private school vouchers to the Silver State. The nation's most expansive ESA voucher law, Senate Bill 302, was enacted in the last biennium session in June 2015. The program never got off the ground after a group of public school parents challenged the law in court. The parents in Lopez v. Schwartz argued that the voucher law violated the ban in the State constitution against diverting public school funding to a non-public purpose. In September 2016, the Nevada Supreme Court agreed with the parents and issued an injunction permanently blocking the program. South Carolina is making progress in limiting its school-to-prison pipeline, thanks to new state Department of Education regulations growing out of a school incident which went viral nearly two years ago. The background: in October 2015, a teenager at a Columbia, SC high school refused repeated demands to put away her cell phone. Both the cell phone and the teen were quiet, and not interfering with any other student. When she refused, her teacher involved her assistant principal. When she refused his demands to put away the phone, he involved the school resource officer (SRO). And when she refused his demands, he arrested her for the crime of “disturbing schools” and was caught on video pulling the child out of her chair and, as the local sheriff later put it, “throwing  the student across the floor,” making this another in a now-long list of questionable cases of SRO actions in school. To top it off, he arrested and charged a second student with disturbing schools for encouraging her classmates to record the incident (that is, the recordings which brought this incident to the public’s eye) and objecting to the officer’s treatment of the teenager with the cell phone. The evolution of education policy rationales can make for interesting study. Last week, Betsy DeVos, the secretary of education, explained in a Wall Street Journal column why the structure of federal student loan servicing needed to change. Instead of maintaining a stable of companies that service loans for student borrowers – servicing entails receiving and keeping track of payments, keeping track of borrowers, ostensibly trying to keep borrowers out of default – the Education Department would move to a single servicer model. “Simply put, the current systems used by Federal Student Aid are not designed to put customers – students and their parents – first,” DeVos wrote in explaining the move. The process, which she went on to characterize as “complicated and rife with confusion,” makes it too burdensome for students to get questions about their loans answered, for example. For those unable to access the recent Alabama decision allowing a predominantly white community to secede from its more integrated parent district, I am uploading it for your convenience. See below.